Teaching Kids to 'Just Breathe' Through Meditation. Diaphragmatic breathing in Qigong practice positively affects the vagus nerve which regulates the autonomic nervous system, vital organs, and body function. MINDFULNESS: Spanish schools teach meditation to children to improve mental health. EuroWeekly. Feb 10, 2019. Teaching Qi Gong to Children. After only one session of Qigong, the results for children may be memorable and reproducible even away from the group. Giving a child beginner skills can be life changing. Qi Gong has the power to bring one physical ease, mental clarity, emotional stability and spiritual awareness. That is worthwhile at any age. 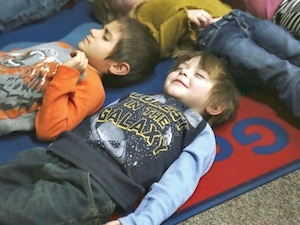 Mindfully me: Teaching meditation to children. Use of Yoga, Meditation, and Chiropractors Among U.S. Children Aged 4–17 Years. NCHS Data Brief: Report shows increase in use of yoga and meditation by children. At 15 local schools, mornings that start with mindfulness help kids 'de-escalate and reflect'. Mindfulness in Education. Mindfulness in education or in the classroom, implies a host of different things- it can be something as simple as calming the children down before the start of a class to something more complicated like studying the effects of words on their emotions or just making them aware of their environment and their role in society. Developing a Health Qigong program for children: a 16-week curriculum. The Health Qigong for Children program has been successfully applied at several local elementary schools. Theme-based lessons and effective teaching strategies helped the Health Qigong program to be fun and age-appropriate for children. Mindfulness instruction improves psychological functioning and may ameliorate the negative effects of stress and reduce trauma-associated symptoms among vulnerable urban middle school students. Promoting Prosocial Behavior and Self-Regulatory Skills in Preschool Children Through a Mindfulness-Based Kindness Curriculum. Self-regulatory abilities are robust predictors of important outcomes across the life span, yet they are rarely taught explicitly in school. Using a randomized controlled design, the present study investigated the effects of a 12-week mindfulness-based Kindness Curriculum (KC) delivered in a public school setting on executive function, self-regulation, and prosocial behavior in a sample of 68 preschool children. The KC intervention group showed greater improvements in social competence and earned higher report card grades in domains of learning, health, and social-emotional development. Qigong for the Classroom: A study published in the June 2007 issue of the Journal of Chinese Medicine has found that including a particular type of qigong exercise program helped calm and energize the students, as well as improving health and reducing aggression. Qi Gong comes alive for children ages 2 to 9 through this original song and book with accompanying video. Basic moves are combined with catchy lyrics for easy learning in Let the Rain Fall Down. Children as young as two years old and even adults love this song. A moving meditation, Qi Gong emphasizes deep breathing with coordinated, repetitive motions. The exercises are reflective of nature, like a tree rooted and reaching for the sun, a bird flying high in the sky and a warm, gentle rain. Standing with enough room to spread their arms, children benefit physically, emotionally and mentally with this powerful tool. Dr. Gaspar Garcia realized that if businessmen had been taught from their childhood simple breathing and relaxation techniques, as well as basic preventive medicine concepts, they would not suffer as adults the devastating effects of stress. The Smart Living Program was born from that realization. This program was implemented in schools in Costa del Sol, Spain, and its objective was to convey these teachings to children and young people so they would be able to benefit from them throughout their lives. Mindfulness in practice: Considerations for implementation of mindfulness-based programming for adolescents in school contexts. The author formulates initial recommendations for successful school-based implementation of mindfulness. Practical resources and recommendations for finding, choosing, and successfully implementing and sustaining a mindfulness program in an educational context are provided. 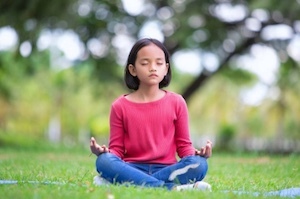 Learning to BREATHE: An intervention to foster mindfulness in adolescence. During adolescence, young people are traversing exciting and also challenging stages in their development. Mindfulness, if taught in a developmentally appropriate way, has the potential to be an asset in adolescents' lives. Developmentally appropriate approaches of mindfulness intervention during adolescence need to consider adolescents' social contexts (for example, school setting, peer group, family), their cognitive and emotional stages in development, and age-specific strength and vulnerabilities. Physical health benefits of health Qigong and Energize programs in American elementary school classroom.Health Qigong can be as effective as aerobic exercise and physical education activities in reducing heart rate and increasing Sit-and-Reach among elementary school children. In particular, body mass index decreased more quickly in the Health Qigong group than aerobic exercise or conventional physical education activities. 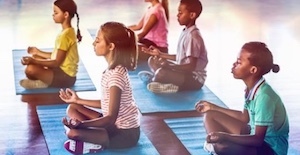 Review finds yoga improves children's physical and mental well-being, and yoga in schools helps students improve resilience, mood, and self-regulation skills pertaining to emotions and stress. Hiruko incorporates Qigong and Tai Chi fundamentals into martial arts training for youngsters. Children need more meditation and less stimulation. Yoga Therapy for children with special needs. The David Lynch Foundation is bringing meditation to schools to help with a silent epidemic among young people: stress. Research partnership brings mindfulness/yoga practices to schools in Middle East. Palestinian educators, health professionals, social workers and refugee service providers recently received training in Transformative Life Skills (TLS) -- a social-emotional learning program that aims to reduce students’ stress and promote social-emotional health and physical wellness through mindfulness and yoga training -- from a team of trainers and researchers from Penn State, the University of California at San Francisco (UCSF) and the Oakland-based nonprofit Niroga Institute. Should Meditation Replace Detention in Schools? Substituting Meditation for Detention Apparently Works Wonders For Kids. For years a Baltimore school has sent more difficult students to their "Mindful Moment Room" instead of detention. The result has been zero suspensions. A Wisconsin school has replaced detention with meditation and is seeing incredible results. Mind-Body Practices Like Meditation And Yoga Help Teens With Anxiety, Study Finds. Teenage anxiety is a pretty common occurrence these days—and it’s not just the usual stress implicit in adolescence. Almost a third of teens have a full-fledged anxiety disorder, according to prevalence studies, and, as with other mental health disorders, there just aren’t enough effective treatments. A small new review study looks back over the evidence, and finds that several mind-body practices are helpful in treating teen anxiety, in school and at home. More. Mindfulness training benefits high school students. Teaching meditation and yoga in high school. Meditation Becoming More Popular Among Teens. Educator Jay Robbins describes how to integrate Qigong into school physical education programs in A New Approach to Mental, Physical, and Emotional Achievement in the Ken-Ton School District. MentorOhana started in 2003 on the Garden Island of Kaua'i as an online empowerment tool for teens. It has been used to create personal assessments from thousands of teens and adults over the years as a way to empower individuals to make good decisions. Through its Tracking tools, a Member can follow their development over time and see patterns and how their choices affect their lives. Qualitative evaluation of a high school yoga program: feasibility and perceived benefits. Harvard study finds many benefits to 9th and 10th graders including stress reduction and promoting healthy behaviors at a societal level by focusing on the prevention of negative patterns during the adolescent transition. A Randomized Trial Evaluating School-Based Mindfulness Intervention for Ethnic Minority Youth: Exploring Mediators and Moderators of Intervention Effects. The study provided evidence that mindfulness intervention was beneficial for low-income ethnic minority youth in reducing perceived stress and internalizing problems, and improving emotion regulation outcomes. Furthermore, mindfulness training was associated with reduced mental health symptoms via improvements in emotion regulation. Breathe Deeply: Mindfulness coming to a school near you. Mindfulness training for teens 'brings them back down to earth'. Summer camps are increasingly bringing mindfulness into their teaching spaces to help youth reduce stress and boost attention. Yoga and mindfulness activities at school can benefit children with anxiety. Participating in yoga and mindfulness activities at school helps third-graders exhibiting anxiety improve their wellbeing and emotional health, according to a new Tulane University study published in the journal Psychology Research and Behavior Management. Tai Chi for Kids has been adapted for students with special education needs, including those in wheel chairs and who have severe physical and mental disabilities. Children in Uganda at an elementary school for AIDS orphans love to do Tai Chi. Here they are doing the elephant. Another favorite is the tiger. You should hear the breathing sound of the ferocious tiger as it focuses and charges. 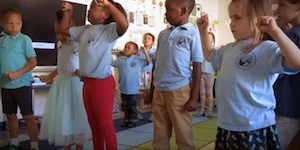 Harvard Medical School finds school-based yoga advantageous for stress management and behavior in second- and third-grade students. Mind-body integration practices reduce stress in children. The intervention enhanced health at an individual level and favored social network diversity at a group level. Our research illustrates how children can incorporate techniques that help them cope with stressful moments. San Francisco Schools Transformed by the Power of Meditation. In the past 12 months (as of July 2010) Tai Chi for Kids workshops have been given in California, Florida, Massachusetts, New York, Illinois, Indiana, Colorado and Mexico. Schools in Australia and Great Britain love the Tai Chi program. With video conferencing Tai Chi workshops can be held anywhere. As teachers we inspire our students with knowledge, tools for success and a belief in our own success. Tai Chi is helping us realize these goals through flowing movements for relaxation, focus, and concentration. Michelle Broady, PE teacher at PS 45 in Brooklyn, NY has taught Tai Chi to the whole student body. They have done it simultaneously with the music over the PA system as part of the ACES program. One fifth grade teacher now does Tai Chi Moves every morning with his whole class. Every student in this class is in the top third of all students in this Grade A school. They are so proud. Ms Broady has taught Tai Chi in day care, in the scouting program and finds it particularly beneficial in the Modified Education classes. Not only do the kids love it, but it helps in transition from lunch or between different activities. Tai Chi Moves (see Tai Chi for Kids) can be used as part of the State mandated minutes of physical activity in the classroom or in PE. During and after five weeks of tai chi lessons, adolescents with Attention Deficit Hyperactivity Disorder (ADHD) showed less anxiety, daydreaming, inappropriate emotions and hyperactivity, according to a study by the Touch Research Institute (TRI). Attention Deficit Hyperactivity Disorder: benefits from Tai Chi. Press Release: New research shows Transcendental Meditation improves standardized academic achievement - A study with at-risk urban middle school students. Meditation should be "an everyday task, like brushing your teeth," says Goldie Hawn who recommends daily meditation to create well-being, health, and happiness. Hawn describes the benefits of a personal meditation practice. She also mentions the Hawn Foundation'sMindUp program which is bringing the multi-faceted benefits of meditation to schools. 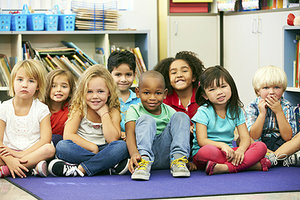 MindUP™ is a comprehensive social and emotional learning program for pre-kindergarten through eighth-grade students, and is informed by current research in the fields of cognitive neuroscience, mindful education, social and emotional learning, positive psychology, and evidence-based teaching practices. Meditation helps kids perform better at school. A University of California, Los Angeles study found second- and third-graders who practiced "mindful" meditation techniques for 30 minutes twice a week for eight weeks had improved behavior and scored higher on tests requiring memory, attention and focus than the nonmeditators. Another study of more than 3,000 children in the San Francisco Unified School District found a dramatic improvement in math test scores and overall academic performance among students who practiced transcendental meditation, a form of mediation that promotes relaxation and "an awakening" of the mind. The study also found a decrease in student suspensions, expulsions and dropout rates, ABC News reported. 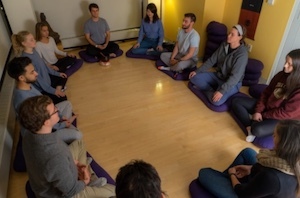 'Mindfulness' meditation technique finding new fans in Triangle and beyond. "The formal practice of mindfulness meditation is like going to the gym," she said. 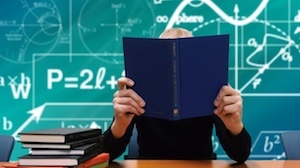 "You are training your brain toward focus, toward being able to marshal your own attention." Researchers from Carnegie Mellon and the University of Pittsburgh showed why this works by looking at MRI images of study subjects who had been practicing mindfulness meditation for eight weeks. The images showed a decrease in the size of the amygdala, which is the "fight or flight" center of the brain. Yoga, mindfulness reap big benefits for Philadelphia elementary school. 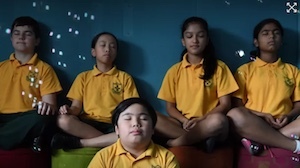 Instead of going straight into their next lesson after recess or lunch, students at a school in Sydney's west spend up to half an hour on mindfulness several times a week, and teachers say the lessons have improved focus and productivity. More. Students in England already learn about mathematics, science and history, but hundreds of schools are preparing to expand the traditional curriculum with a new subject: mindfulness. “It’s not just to make them feel better in the short-term,” Dr. Deighton said, “but to better equip them for later in life.” New York Times. More. Pushing for Peace is a program that promotes mindfulness and calm, decreasing youth violence. Tai Chi at the airport by a budding Tai Chi master. For many kids, sitting still all day in school is a big challenge, which is why movement breaks are good practice, whether it's in elementary school or high school. Additionally, learning science shows us that movement activates the brain and improves cognition. More. Meditation, Nutrition, Fitness: One 'Party School' Tries To Tame The College Brain. Mindfulness-Based Interventions help High School and College Athletes Reduce Stress and Injury, and Improve Quality of Life. Systematic review shows Tai Chi yields psychological and physical benefits, and should be considered by higher education institutions as a possible means to promote the physical and psychological well-being of their students. Many colleges and universities offer Qigong instruction and degree programs. They are very often associated with the Physical Education and Kinesiology departments. Information and Meditation -- Improving attention in the digital-age In the University of Washington Information and Contemplation class, participants scrutinize their use of technology: how much time they spend with it, how it affects their emotions, how it fragments their attention. They watch videos of themselves multitasking and write guidelines for improving their habits. They also practice meditation—during class—to sharpen their attention. "77 percent of medical students believe that patients whose doctors are knowledgeable about complementary and alternative medicine benefit more than those whose doctors are trained only in Western medicine." Five Branches University Graduate School of Traditional Chinese Medicine. (UC Davis, The California Aggie) Maintaining homeostasis in the body is perhaps the single most important factor related to health. Homeostasis is created through focus, calmness and opening of internal circulation through breath, blood, lymph and body heat. As these bodily systems begin to regulate, there is of course nothing wrong with hittin' the treadmill. The heart is just one organ (albeit an important one) that stays in shape through cardiovascular activity. However, there are multiple organs in the body that require upkeep. More. Changes in Mindfulness, Well-Being, and Sleep Quality in College Students Through Taijiquan Courses: A Cohort Control Study. Tai Chi improves sleep and reduces stress in college students. The study, which appeared in the March 2013 issue of Psychological Science and was reported by The New York Times Wednesday, found subjects who participated in two weeks of “mindfulness training” had improved test scores and memory capacity as well as reduced distracting thoughts. Students benefit from meditation stress management techniques. What started as a six-person class over 15 years ago has grown into a 60 or 100 student waitlisted course, making it one of the most popular classes taught at Carleton. Meditation is a fundamental component of Qigong. Contemplative neuroscience, self-awareness, and education. The underlying networks supporting various types of self-awareness are malleable following meditative practice. However, the field of education has developed independently from the study of the self and its relation to contemplative neuroscience thus far, and to date there is no systematic account linking this accumulating body of knowledge to the field of education or discussing how it might be relevant to teachers. Meditation helps kids pay attention, leading researcher says. About 200 students at four elementary schools have used breathing techniques to hard-wire their brains to improve their ability to focus on their work. "It's so widely popular and successful, the district wants us to scale it up the entire (Madison) school system." Neuroscientist touts benefits of meditation for kids. "Simple meditation techniques, backed up with modern scientific knowledge of the brain, are helping kids hard-wire themselves to be able to better pay attention and become kinder, says neuroscientist Richard Davidson." Meditation can boost test scores, study suggests. The study, which appeared in the March 2013 issue of Psychological Science and was reported by The New York Times Wednesday, found subjects who participated in two weeks of “mindfulness training” had improved test scores and memory capacity as well as reduced distracting thoughts. Johns Hopkins School of Medicine trial shows meditation improves psychological functioning of urban male youth more than standard health education. Focusing and Calming Games for Children. Meditation should be "an everyday task, like brushing your teeth," says Goldie Hawn who recommends daily meditation to create well-being, health, and happiness. Hawn describes the benefits of a personal meditation practice. She also mentions the Hawn Foundation's MindUp program which is bringing the multi-faceted benefits of meditation to schools. 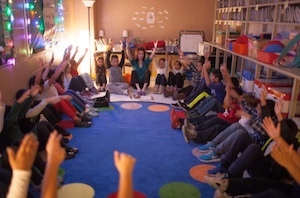 MindUP™ is a comprehensive social and emotional learning program for pre-kindergarten through eighth-grade students, and is informed by current research in the fields of cognitive neuroscience, mindful education, social and emotional learning, positive psychology, and evidence-based teaching practices. The David Lunch Foundation, a 501(c)(3) organization, was established in 2005 to fund the implementation of scientifically proven stress-reducing modalities including Transcendental Meditation, for at-risk populations such as underserved inner-city students; veterans with PTSD and their families; American Indians suffering from diabetes, cardiovascular disease, and high suicide rates; homeless men participating in reentry programs striving to overcome addictions; and incarcerated juveniles and adults. David Lynch gives his insights on consciousness, creativity and benefits of Transcendental Meditation. Note: Transcendental Meditation is just one of the many types of meditation that bring about the same results. The only difference is in the particular way that the meditation is practiced. Some types of meditation have movement and others do not. Particular types of breathing may or may not be incorporated. The use of mantras is important in some types of meditation such as TM. For more on meditation see Meditation. The Chinese go to great lengths in schools to encourage a lifelong habit of exercise. They have very commendable programs for their children, including healthy meals in schools. Tai Chi is an important part of their wushu practice described in the video. From personal observation, in modern China it seems that voluntary physical activity participation in public spaces, especially during the AM, is predominately older people and not the younger generation. Qigong and Tai Chi are the main practices. Perhaps life's distractions become too great after secondary school. Nonetheless, the government saves enormous amount of money on health care costs because of its citizens' large-scale participation in regular exercise. 4 year-old doing Five Animal Frolics at the 7th Hong Kong Wushu International Championship. 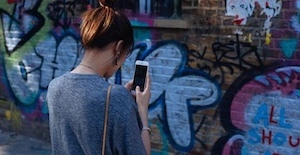 Psychotherapist and mindfulness teacher Gina Biegel explains what practices work best with young adults (and if you should even try to make them put down their smartphone). Read the article. What these kids really need is Qigong, and not just the mindfulness part of it. Add diaphragmatic breathing integrated with the mindfulness. Then layer on some movement. Now you have a basic Qigong practice. The author mentions that more active practices will have a greater appeal to teens. The coach of the rescued boys taught them techniques to stay calm, and any parent can use meditation to help their children deal with stress. Read Article. "[The coach] helped keep the boys breathing and emotionally balanced during the crisis, and also readied them for their hours-long treacherous escape guided by expert cave divers. 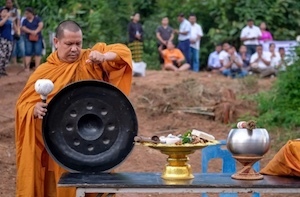 In the process, he also gave them vital tools they needed — specifically, teaching them how to tap into their own tranquility and inner stillness. He taught them how to keep themselves calm; a minor but magnificent distinction." More. Dr. Daniel Siegel explores the neural mechanisms beneath social and emotional intelligence and how these can be cultivated through reflective practices that focus on the inner nature of the mind. He talks about a way of making important changes in the "minds" of our children, which will change the future of the mind and our culture. "You're never too young or too old or too old to learn how to take care of your body." That's how Deborah "Deb" Lewis described the importance of teaching mindfulness — a practice of being in the present moment with nonjudgmental awareness — to young children. This week, Lewis began two eight-week mindfulness education programs, one at Molly Stark Elementary, and another at Pownal Elementary. 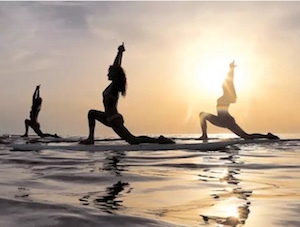 "The younger you start, the easier it is for them to incorporate it into their everyday lifestyle," said Lewis, who owns Manchester-based Mindful Paths Stress Management & Yoga. "And that's important in mindfulness." More.